It is not a secret that flowers can make people happy. No matter what the occasion is, flowers have the power to brighten up the mood and fill the hearts with joy. Because of their vibrant nature, vivid colours and fresh fragrance, flowers are a great remedy for dull mood, sadness or even depression. Have you wondered why flowers have that positive impact on our emotions? Here are 4 proven facts explaining the effect that flowers have on our emotional health and good mood. We all know that a good sleep is essential for our overall health. Having not enough sleep always results in lack of concentration and increased anxiety during the day. There are certain flowers that can be included in your bedtime routine to help you feel more relaxed and sleep better. For example, lavender is proven to lower the blood pressure and heart rate, thus helping you to relax easily and enjoy a quality sleep. Emotions can be influenced by colours. When choosing a bouquet to send or a plant to grow at home, always think of the feeling that each colour is associated with. Blue flowers are considered to have a calming effect. Yellow flowers evoke feelings of true happiness and lightheartedness. White flowers are associated with elegance and purity. Green is considered to bring along a feeling of safety and creativity which makes green plants perfect for any office space. 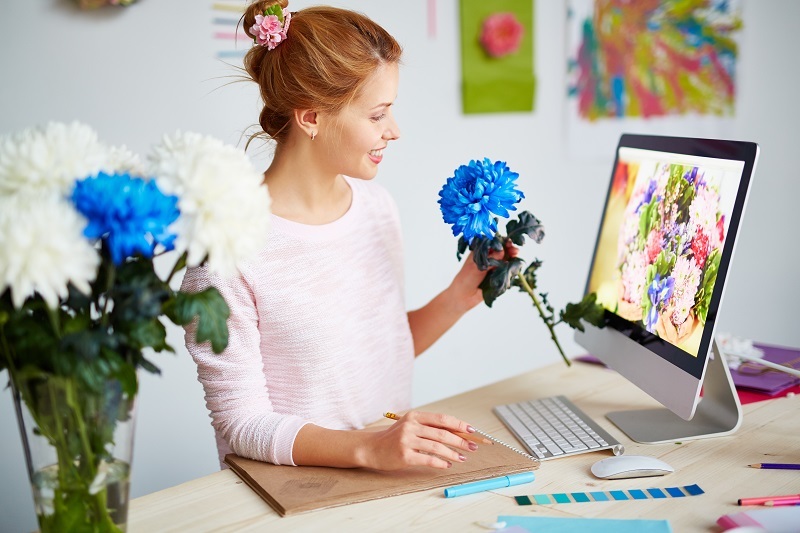 Certain flowers/colours can influence your creativity and make you more productive. Having a favourite flower around white working is thought to make you feel more inspired, more concentrated and even safer. Combining the feelings of happiness and safety is sure to help you solve any problem and deal with work more efficiently. Natural scent of flowers is a wonderful remedy for a stressful and exhausting day at work. It can help you relax your body, relieve the anxiety and calm your mind. With the help of flowers, you can easily create a brighter and happier environment in your home or even workplace. Sending flowers to a special someone is a gesture of care and love that is guaranteed to cheer the recipient up and provoke feelings of gratitude and excitement. On the other hand, the sender of the flowers is also rewarded with a flow of loving thoughts and feelings coming from their heart. Choose to make someone’s day truly special and boost their mood with a wonderful autumn bouquet!